Not content with destroying paltry green energy efforts in the UK, the British gov. has now reneged on promises not to destroy the country with fracking. Reading about the rains in Japan reminds me of an old Ray Bradbury Theater episode from the early 90’s. Spaceship crash lands on a planet where the rain never stops, and comes down so heavily that it is hard to even breathe. I devoured his books as a kid. Great mind. Certainly hope this is not our fate. But I can see that if we do not change our evil ways, we will be more like Venus than Mars. Actually, the planet in the sci fi tale you mention was Venus. Bradbury wrote the book before we discovered how hellish the surface really was. Satellites at the time were treated to impenetrable clouds and popular speculative imagination drummed up tales of endless rainstorms. Reality, as it tends to be, was much more stark. The human imagination, such that it is, is a comfortable place. Which is one of the reasons climate change denial, or any kind of crisis denial finds easy rooting there. Thanks Robert! 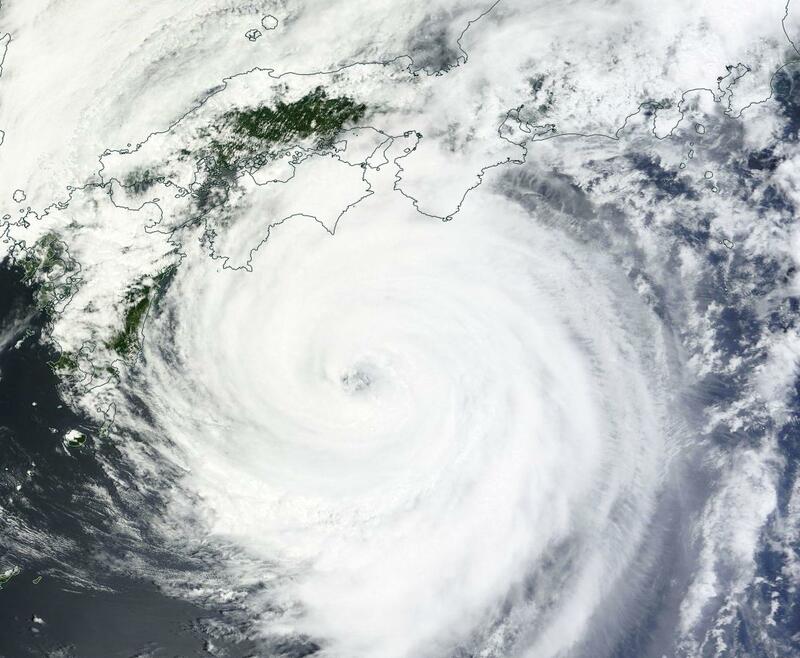 I have been through a typhoon on Kyushu near Fukuoka city and it was no fun in an old apartment with old glass patio doors. I held blankets up to walls in case of flying glass that I remember vividly bowing inward but never breaking. I was a teacher in one of the poorest regions of Japan. Look up Tagawa-gun. The reason for its poverty? Coal. Slag heaps everywhere. Great recruiting ground for the Yakuza of which I lost a few students. Regarding that trough–beginning on the 28th I will note anything I find on the Kenai peninsula and north where I’ll be traversing on land and boat with family. Expecting heavy smoke but maybe lots of rain? Coal is absolutely a poverty multiplier even as it is wealth concentrator. Wreck a person’s environment and what does she have left? Poverty and crime. Will be great to have eyes on the ground in AK. The tendency has been for storms fueled by the ocean influx. Though it would odd if this particular trough lasted until the 28th. Am noting that cap and trade is actually working the U.S. Northeast. Will keep monitoring, but good early signs. Still doesn’t change my preference for a carbon tax. But any well developed carbon reduction policy is better than no policy. Saw that new cap and trade article too. Skeptical outside of this narrow context. Don’t think it can be trusted outside a high law and order, successfully regulated, and enforcing political region. Its a set up for corruption and failure when scaled into anything otherwise. People respond to real numbers that impact them daily. Everyone can wrap themselves around a price on carbon and individual control over their own choices and behavior. I think any bad actors can abuse cap and trade but better than nothing for sure. Could be a layer in addition to carbon pricing for the big players that have to depreciate huge assets quickly by sharing the cost of the write offs and there will be trillions of stranded ff assets to write off. Still the simpler the better. That’s what I’m thinking. My gut is still not to trust it. Holy cow, check out the storm surge. Anyone have thoughts on this typhoon’s storm surge / ocean waves / displacement running through the Bering Strait into the ice pack causing more break up? The developing trough is 995 mb in the forecast, so not the kind of thing that would develop huge waves as forecast. The big issue is the heat transport set up. 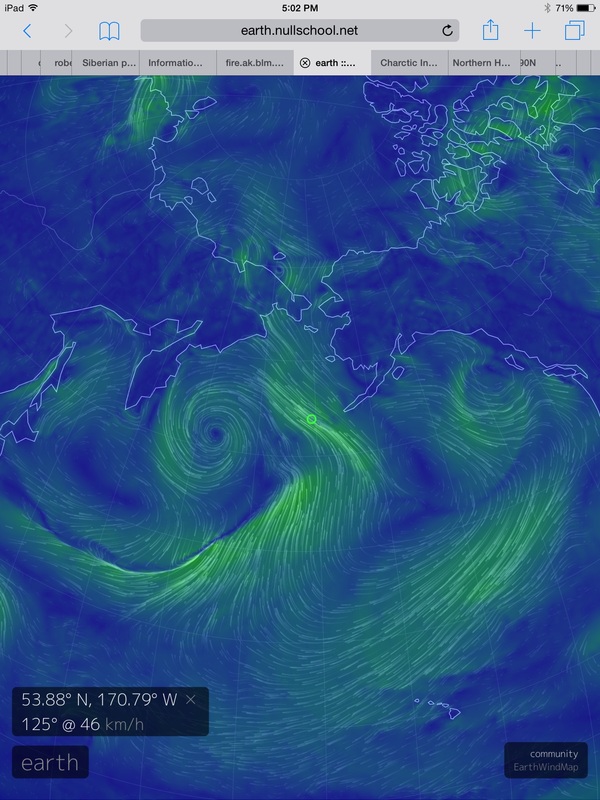 The storm itself kind of lurches in the Chukchi on day 7. But, again it’s not predicted to be too intense as yet. More a warm air and water delivery vehicle in its current forecast incarnation. 8 degrees C SST in the Chukchi and 16 C ( 60 F ) in Norton sound. Huge drop in JAXA. Uni Bremen is starting to look like the U.S. Navy model. And the latest UBremen map shows rapid disintegration of that entire area even before any of that storm has come close. It does look as though the Pacific side is going to see some fairly dramatic changes…think ‘flash melting’…within a very few days. GFS 00z run is bad news with a continuos hammering by a HUGE high pressure in the Pacific sector, especially later in the forecast period in 5-7 days. As of 520 a.m.ST you can update the 23 to 27 inches (690 mm) for the suffering winner of most rain so far– kamikitayama (“wind north mountain”) village. Got it Greg. Good follow up. Cantareira System is dropping at a rate of 0.4 million cubic meters of water per day. The drop rate equates to 0.1% per 48 hours. The current reported volume is 19.3% including dead pool (sludge). 100% of the water available from the 190 million cubic meters total which is reported can only be accessed by pumping it up to the intake. It would require roughly 50 million cubic meters of water added to the reserve in order to get water up to the intake. Although 190 million cubic meters are reported in the reserve, it is highly unlikely that all of that can be accessed as the pumps are having to be moved further into the reserve to find water. Also eventually the topology at the bottom will begin to turn the remaining volume into stand alone ponds. It is tough to guess how many days of reserve actually exist in Cantareira. However, when you peel away the top layer and look at the distribution between the sections of the system, the bulk of the remaining water is in atibainha reservoir (110m cubic meters reported). The other sections are basically tapped out. Flow rates are at 54.1% of normal in the water system (33.26 cubic m/sec). Sistema Alto Tiete is at 19.7%, dropping at 0.2 to 0.3% per 48 hours. At this rate, Alto Tiete will be at 0.0% within 90 days. The total Sabesp system (all reserves / all reservoirs) currently is reporting 560.7 million cubic meters, depleting at a rate of ~1.8 million cubic meters per day. I can’t find how much of the 560.7m cubic meters is actually recoverable. This pic is from February, it is probably worse by now. You can see the pumps (blue boxes in the water). You can see the intake to the water system to the left of the picture. Notice the color of the water, it looks like it has passed through a cow. That’s a frightening picture! The water looks, well, like you said Andy. Next to the pumps (up and to the right in the image) it looks as if there’s piles of material (mud, sand, fill) that’s running into what little water there is. Do you have any idea what that could be? This photo looks like an industrial mining operation, not a reservoir that millions depend on for water. Great analysis, Andy. Holy cow, Andy. This is an excellent analysis. Chilling, but excellent. About 90 days to the rainy season. At 54 percent utilization and basically looking at 165 million cu meter loss at current rates looks like they are going to hurt and hope. Hurt til they get to the rainy season and hope it is not delayed. ven more extreme events elsewhere? By the way, where is Senator Snowball? Has he single-handedly put out the wildfires in Alaska, by pelting them with snowballs? Or is he trying to spell those nasty big words that Sheldon Whitehous uses so he can instruct one of his minions to look them up and find out what they mean? JAXA Drop by 150k+ How the melt potential in coming week? Dipole remains, Greenland High remains. Both stay in place for at least the next 4 days. All this with hot air coming up through the Bering and Chukchi from the Pacific. Lots of really thin ice if you believe what more than half the monitors are saying and what the satellite confirms. I’d say it looks like rapid melt to a massacre next week. It’s starting to look quite rough. ‘Another test of methane hydrates on the North Slope, a potential huge new gas resource, is being planned. We really seem committed to carrying out collective suicide. We already have enough fossil fuels to kill ourselves, yet we are determined to find and burn more. And as always, the government is quick to support such self destructive ventures, while ignoring renewables that could preserve a livable climate and criticizing them as unrealistic. I like to stay positive, but I really think we face a very dark future. This is bad money going after bad outcomes. The ridiculous notion that we can keep burning this stuff and not commit global civilization suicide is like a smoker stating that more cigarettes, though of the filtered variety, are needed for improved health after being diagnosed with lung cancer. There are 20,000 billion tons of hydrate in the world. Extracting and burning it has climate change game over written across it in quadruplicate. Look, we’ve already warmed the world enough to have a small fraction of this stuff come out and cause trouble. But these companies want to create an industrial process that actively extracts them and then links them to an economic system that will demand more and more and more? Fossil fuels Doctor Strangelove indeed. From one of the comments: a graph of ocean heat content. We’ve set some of the hobgoblins of climate change free. Let’s not make it worse than it already is, please. The Nation’s right on that count. Puerto Rico is now rationing water — 2 days off, one day on in some areas. Drought in FL setting off wildfires there. And that’s not to mention the terrible trouble that continues out west. Warming the atmosphere is a guaranteed way of setting off hydrological disasters. Increase the rate of evaporation on one end and precipitation on the other and you end up with trouble. 7-8% amplification of the hydrological cycle for each degree C. So we’re already at that range of difference when compared to the 1880s. The Department of Energy is an Executive branch agency, subject to even whimsical though binding policy and mission directives from the President, is it not? House Energy and Commerce Committee Democrats, environmental experts and local officials held a forum to examine climate change at the local level. It’s good — Q’s and witnesses Navy & civilian. Great to see this, DT! This is pretty decent. The talk of low emissions has me a bit concerned. We should be trying for zero or near zero emissions. Net negative emissions with land use change. That’s the safest path. There’s already enough carbon in that if we keep adding to it, it’s really catastrophic — slow burn or fast burn, but either way you still get there with any net positive emissions on an industrial scale. These guys are too nice. Our current economy basically is held hostage by the energy equivalent of cigarrettes for the environment. That’s not a rational way to run an economy. It needs to be changed. There’s no future in it. There’s a point where shifting a little money here and there doesn’t help. It’s just not enough. You need to stop feeding into the problem. Thanks for this, DT. Good reference! – Note: US Navy related (2011) water temps in Strait of Hormuz at 100 F — above usual 90 F. Harsh and negative impacts on warships. This year is all but certain to crush last year’s record for warmest year. Things really seem to be tipping into completely uncharted territory. We are now topping last year’s record by 0.05 C or more. And that’s without the full effect of El Nino coming to bear on us. These may be arson fires, but they take advantage of Greece’s changing climate zone, becoming more like North Africa every year. Greece’s Islands are turning into little deserts, life has an increasingly hard time clinging to any of the islands. Spain as well is having issues with desert taking over orchards and grass lands. Southern France is also in the zone of climate shift. Their once paradise like climate is headed for hotter drier and desertification. The Sahara is on the march north. And the same goes for the the US Desert Southwest. For it now covers the PNW plus. -Hot river water in PNW Cascadia — sturgeon added to list. The Columbia Ice Field (BC) can’t be doing well either.. The Oregon Department of Fish and Wildlife has banned sturgeon fishing on a long stretch of the Columbia River in response to a spate of deaths among the ancient fish population. Fish and wildlife officials announced Thursday afternoon that the temporary ban will take effect on Saturday. The ban applies to a 151-mile stretch of the Columbia River and its tributaries from Bonneville Dam to McNary Dam. The closure is the latest in a series of actions ODFW has taken to protect fish as severe drought warms water well beyond their tolerance level, killing salmon, steelhead and other protected species in rivers across the state.